Left to right these are Daisy Lane, Queensgate Gardens, Chelsea Embankment Gardens and Richmond Gardens. 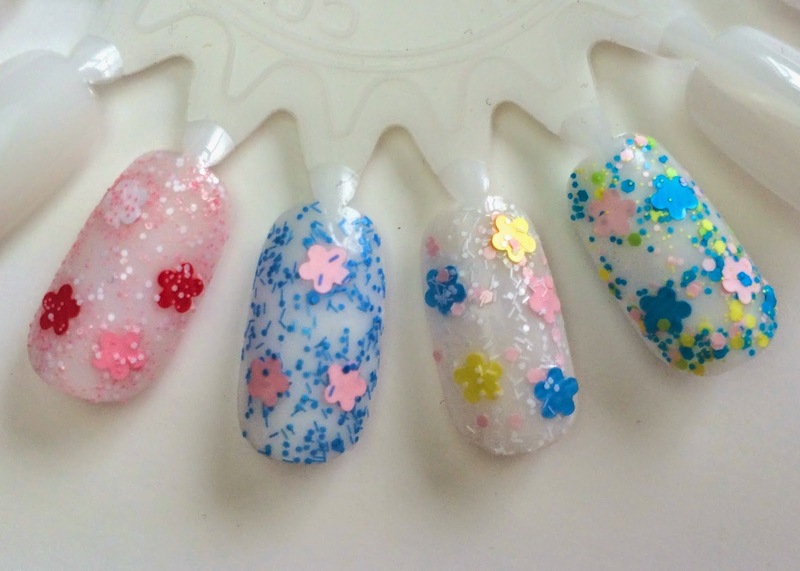 Each of the polishes have a clear base, so you can wear the sprinkles and flowers over any base colour of your choice. Generally I think they'll all look good over white and most pastel colours. Chelsea Embankment gardens is my favourite and I'll be wearing it over a really pale baby blue so that all of the pink and white coloured sprinkles show up. From Nails Inc direct these polishes are £12 each, which I still find a bit steep - although I really like Nails Inc, there are so many amazing budget polish brands out these days that I tend to only buy when I see something really unusual and special like these floral polishes. I picked up the set of all four florals from QVC for the discounted price of £24.50, which I was very happy to pay as these polishes are all gorgeous and I've not seen anything quite like them by another brand... yet!